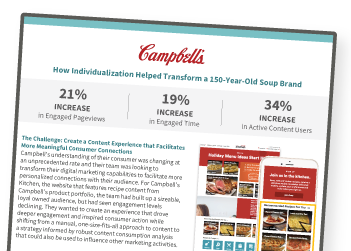 Campbell’s understanding of their consumer was changing at an unprecedented rate and their team was looking to transform their digital marketing capabilities to facilitate more personalized connections with their audience. For Campbell’s Kitchen, the team had built up a sizeable, loyal owned audience, but had seen engagement levels declining. They wanted to create an experience that drove deeper engagement and inspired consumer action while shifting from a manual, one-size-fits-all approach to content to a strategy informed by robust content consumption analysis that could also be used to influence other marketing activities. Read the case study to learn how Campbell's partnered with OneSpot to create a content experience that facilitated more meaningful consumer connections.